Use ‘Edit’ for removing a station in the list. You will be prompted to choose the station you want to remove. Go to ‘I’ to view and adjust the station parameters (protocol; codec; jitter buffer; destination). 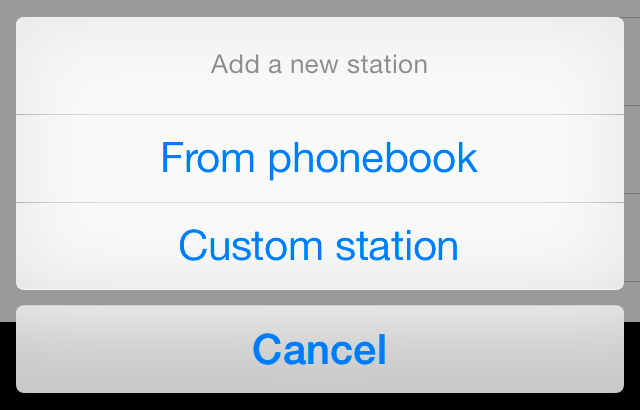 Use ‘+’ to add new stations either by Importing a phonebook (*.csv) or by custom adding a station. After choosing “Stations” of the Settings menu you will find the list of predefined stations, the possibility to edit the stations and to create new ones. To choose a predefined station, simply click on its name. A checkmark will indicate the chosen station. In this figure you see some default stations while the checked station is “Call the Luci office”, you can establish a direct connection between you and the Luci office by appointment. You can then talk to one of our support engineers, this will help us in supporting you. We can also do measurements of your stream for example. 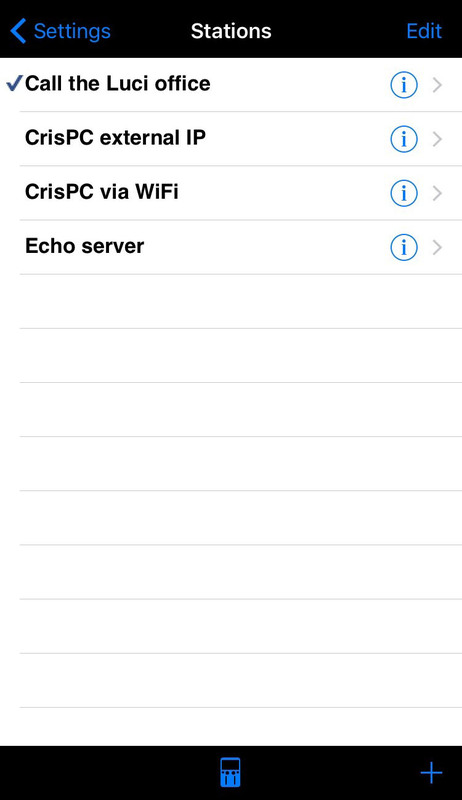 The “Echo server” is a free service and is meant for test purpose only. You can always use this to test your internet connection, the stream you send will be sent back, so you will be able to hear yourself back with a short delay. The server is located in a datacenter in Amsterdam, The Netherlands.